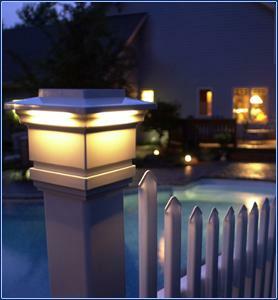 The revolutionary Classy Cap low voltage and solar accent lighting beautifies in two ways. By day it is a detailed, decorative vinyl post cap. But as night falls the magic will emerge, casting a beautiful subtle glow downward onto the outside walls of the cap and surrounding area. 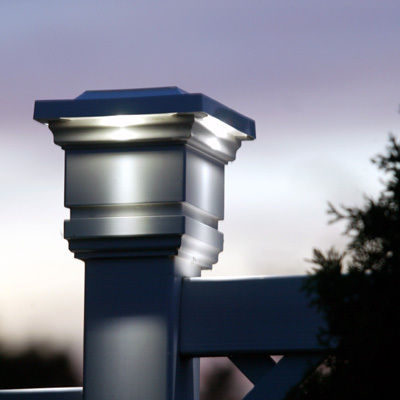 The effect adds radiance and allure to any style of fence... picket or privacy, deck or porch rail... or to a mailbox post, walkways and more. Classy Caps do more than just beautify, they contribute security and value to your property. © Copyright 2006 Discount Fence Supply, Inc. All Rights Reserved.